I had 4+ yards of a medium/dark denim, and decided I might even be able to squeeze two pairs out of it if I was careful. My first fabric-squeezing effort involves the back leg. Take a look. Notice how the back leg hangs over the selvedge edge? And finally the back pattern piece laid out on the “extended” fabric, which now has sufficient room for the upper back leg area. Sweet! And here you can see how I was squeezing in all the bits and pieces you need for a pair of classic jeans. Well, after all was said and done I did not end up with quite enough for a second pair of jeans for me – tho I could easily get a pair out for someone shorter, and definitely could get a cute skirt or a casual short-ish jacket for me out of the leftover yardage. Not bad. 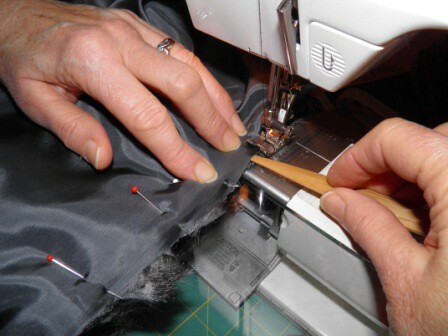 I am always glad when the cutting, marking, and interfacing is done and I can get down to the fun part of using my power tools, err, sewing machines. I REALLY love sewing jeans because I set up 3 machines. 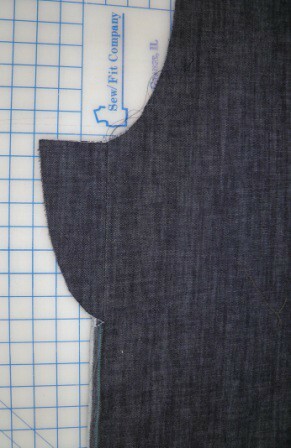 One sewing machine is loaded with a denim needle and navy thread – for seaming. 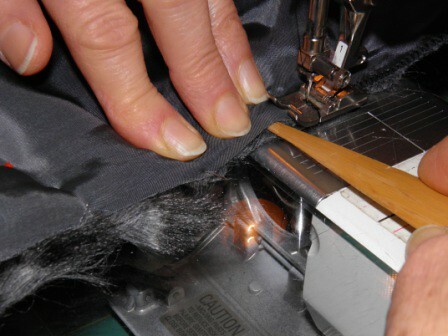 Another sewing machine is loaded with a denim needle and jeans top-stitching thread in the needle and regular polyester thread in the bobbin, and my serger is loaded with navy or black cones for overcasting the edges. LOTSA power tools are employed when jeans are being made! More to come on this project. I normally am thrilled with many patterns in new Vogue pattern collections, but the Spring 2012 collection is, well…..a yawner IMHO. I thought most of the designer offerings looked like they had been sketched on the back of a cocktail napkin, although I do think both of the Anne Klein designers are total winners. I really love this sleek, polished jacket and slim pants from Anne Klein. I could see this in wool crepe for fall/winter,and linen for spring would be smashing. Maybe in the new Tangerine Tango!! Love, love, love this feminine and sophisticated blouse, also from Anne Klein. 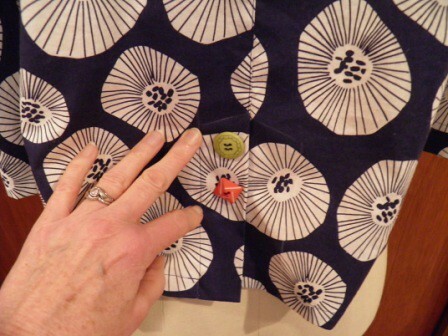 Silk chiffon, a pretty voile – YUM. I would totally dig wearing this sweet little vintage reproduction – UH-dorable. 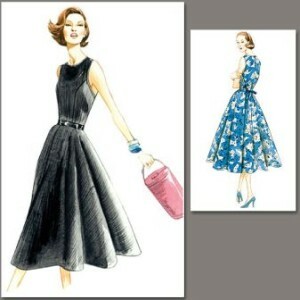 Classic styling that could be dressed up or down depending on fabric. Big, face-framing collars on jackets are a sure-fire hit with me. 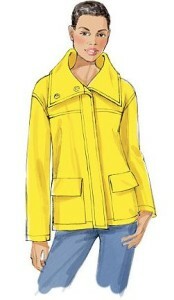 Wouldn’t this easy, breezy jacket look fresh in a bright poplin? What do you think of this new collection? Is it a winner, a big flop, or somewhere in between? 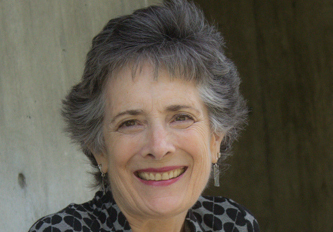 I’d love to hear your thoughts – send me a comment! 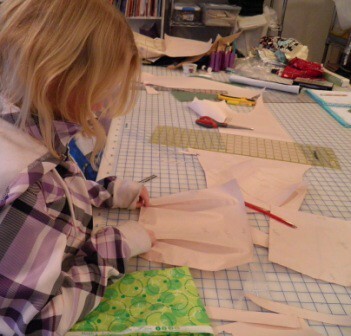 At her last sewing session, we worked on mocking up her design in paper first. 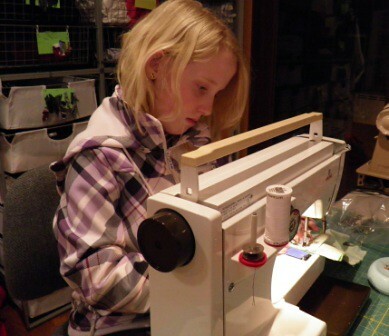 She decided about how big she wanted the thread/scrap holder to be, and then set to work designing the shape and style. After she was happy with her paper prototype, we evened up the pleat placement and transferred all the measurements and markings to a clean paper pattern. Who says you don’t use math in real life? 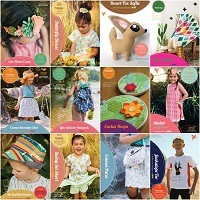 Here are all her paper pattern pieces, the initial inspiration product on the bottom left, and the green fabric she is going to use for the new-and-improved-Malia-scrap-bag-pincushion. It’s true I gave her a little advice and a couple of suggestions, but Malia was in totally charge of this project. She had a very clear design concept, and gave a quick, definite answer to every one of my questions. 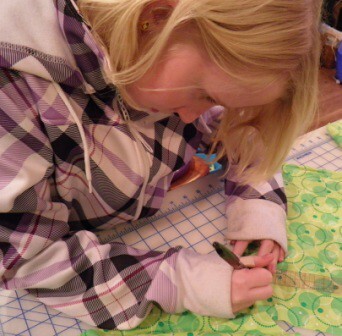 I was blown away that a 10 year old could manage a project with this many steps, draft a pattern from scratch, and transfer it to fabric and make it come to life. I doubt I could have accomplished that at age 10!! I did cut the fabric pieces out for her since rotary cutters and sewing scissors are not intended for use by children, and then Malia transferred the pleat marks to her bag fronts. Check out her concentration while she is working on her project! Malia was ready to get going assembling her bag. 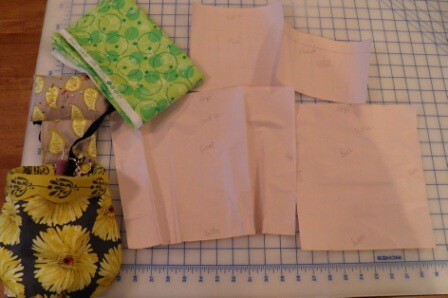 Since she had made a few lined zipper bags during other sewing lessons, she had a pretty clear idea how to go about the first steps of the construction process. 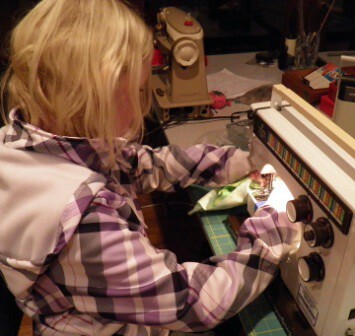 And of course, she is a whiz at using her machine and doesn’t need any help from me in that department. Malia took her invention project home and planned to try to finish it up on her own. Just like last week when she found a rip in her snow pants, set up her sewing machine, and mended the rip so she could stay dry while playing in the snow. LOVE that independent spirit of self-reliance, Malia! 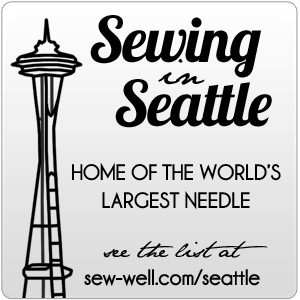 I decided not to make a list of resolutions (sewing or otherwise!) this year, but the nagging thought about “what do I want to focus on next” has been swirling around in my head for weeks now. And by George, I think I’ve finally got it! In a word, excellence. I need some more of it, and I want to give more of it to my students. I want to “re-learn” the Japanese tailoring techniques taught to me by Judy Barlup. 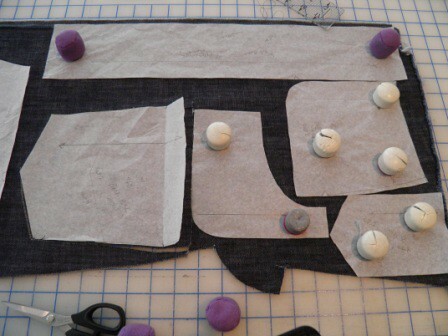 I want to perfect my skills at making jeans – both fitting and construction. 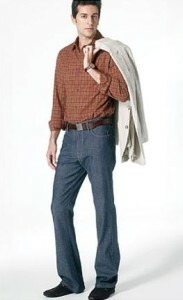 I want to try my hand at making men’s dress slacks. I want to enter some contests. I want some of my students to enter design programs, and win competitions, and sew things they never dreamed they were capable of. I want 2012 to be the year of “go big or go home”. So let’s do it! What do you want to rock in your sewing studio this year? I am a big fan of Sewn Square One patterns. Not only are they fresh, hip, and ultra modern – they are WELL DRAFTED! 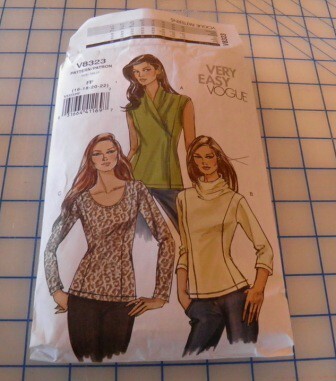 There is (almost) nothing I hate more than paying good money for a sloppy pattern. I expect those notches to line up, all the pieces to fit together accurately, and good grading between sizes. You get all that, and more, from Sew Square One. Good design and well-written instructions, too! Amazing as it may seem, I did not have two coordinating cotton prints in my stash, so this project required a trip to the fabric store. 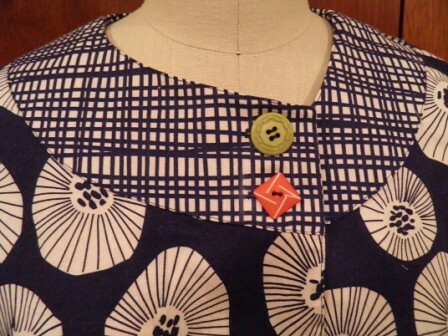 I love this Marimekko-esque print by Brooklyn designer Lotta Jansdotter for Windham fabrics, and the coordinating uneven check was perfect for the collar and pocket details. Look at this cute little spring jacket! IMHO, the fabrics, design, and mis-matched buttons all combine to give this garment a really fun, arty look that I think DD will really like. 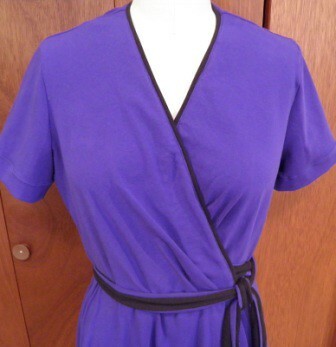 I love the asymmetrical collar shape – this feature alone could have sold me on the design – I am a sucker for asymmetry. More of the check (and buttons!) on the pocket flaps. 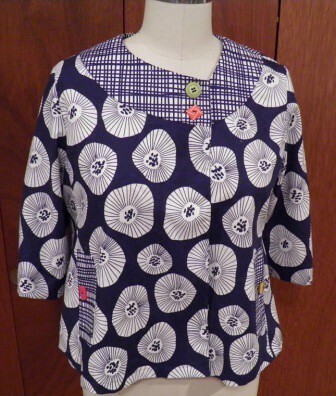 The back has a cute little vent and is a perfect spot to add a couple more buttons – just for show. This pattern is a keeper, and I plan on making it again. Maybe even for myself!! I have a stash reduction plan for 2012. 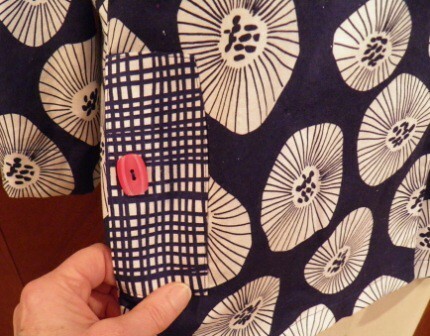 Shop my stash before going to the fabric store, and sew like crazy. I am sure all four of my children and my DH are rolling their eyes, or possibly rolling on the floor at these words, but I actually am making some progress. Like this cute knit dress I finished for my youngest DD the other day. 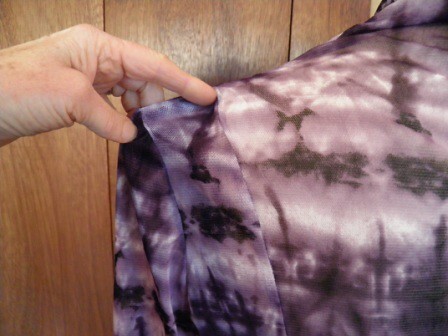 I used a purple cotton lycra knit that has been aging in my studio for a good long while. The only downside of this fabric is the dress weighs about 20 pounds, and will probably take 3 days to hang dry! I cannot remember exactly when or where I bought this fabric (always a bad sign, eh? 😉 ), but I am moderately sure it was 5+ years ago in Shanghai. Or not. 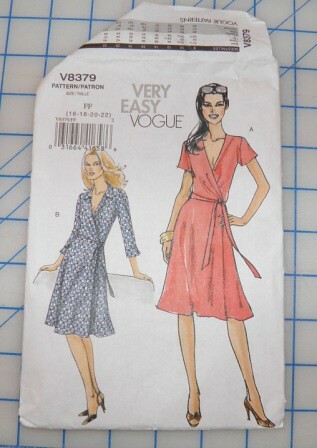 At any rate, I had enough to cut out MOST of Vogue 8379, but not enough for the belt. A design opportunity! What you can’t see from this photo is that the purple edging on the belt is made up of teeny-tiny lengths of purple scraps sewn together to create a long enough strip to go around both ties. T-E-D-I-O-U-S. The black edging around the neck was much easier because I didn’t need to piece it, and it makes the contrast belt look like it was planned, right? 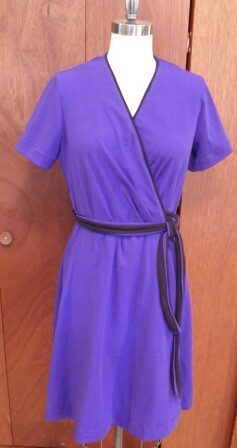 While I was making it I was really hating the annoyance of the belt, but I think it turned out cute and very wearable. And she likes it, so that is always a plus! 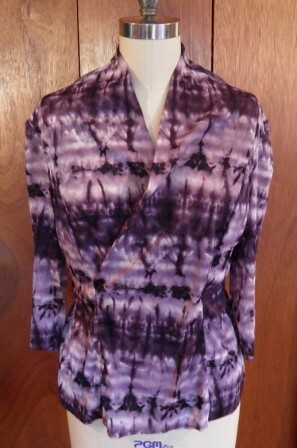 Not to mention it is one less piece of fabric and one less project still sitting in my sewing studio! 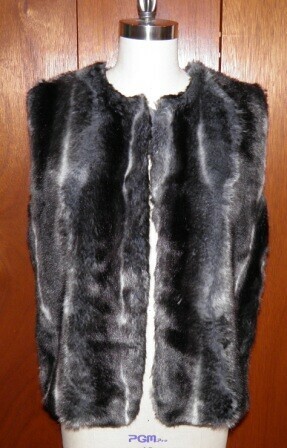 I hardly ever get “the” current fashion trend actually made at its height of hipness, so I am pretty jazzed that I actually ordered some beautiful Tissavel fake fur from emmaonesock.com, bought a pattern designed for fur, AND actually constructed the vest all in the same season. Shocking!! Other than applying the fur trim to Anna’s purple fleece coat, sewing an entire fake fur garment was a new experience for me. I did a little research on recommended techniques, and basically followed Donna Salyer’s advice. 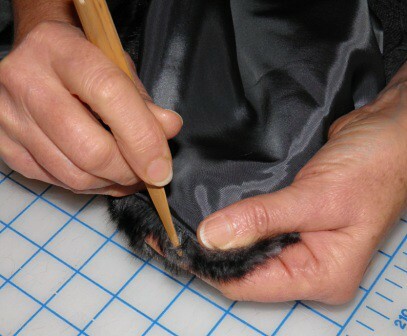 In short, cut the fur from the back side, use 1/4 inch seams, zig-zag all seams, line with Bemberg or similar lining fabric, vacuum as you go, etc. 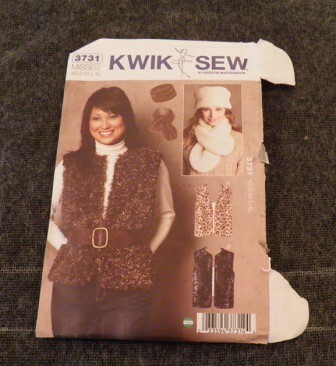 The pattern I chose was Kwik Sew 3731, since I wanted very simple design lines so the fur itself would be the focus. I may even be able to squeeze the hat out of the scraps if I do a little piecing! 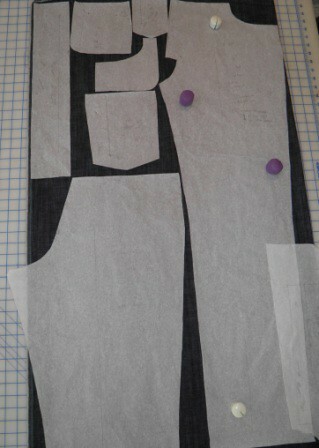 I traced my size onto tissue, and converted the back from an “on the fold” to a full size pattern piece. I did not trace off a left and right front, but I did remember to flip the pattern after chalking around the first front! 😉 I chalked around the pattern pieces onto the backing – but you could probably also just pin and snip around the pattern piece. The placement of each pattern piece on the fur was challenging. My fur has pelt lines and wavy white striped running thru it. I tried to make the layout as symmetrical as possible, but because the white “stripey” lines were irregular I had a really hard time. Maybe a more experienced furrier would have made a different layout choice, but I am pretty happy with the way it turned out. 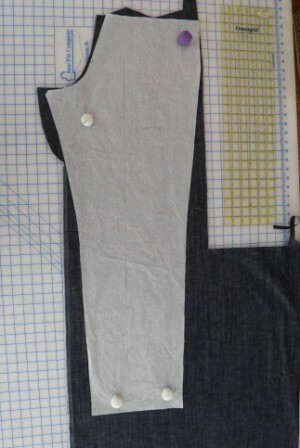 The only pattern alteration I made was to lengthen the vest by 1.5 inches, which you can see on the tracing of the vest back. Pinning and sewing the seams was WAY easier than I thought it would be. Maybe because I was using such expensive fur? I don’t know, but my normal pins went thru the fabric easily, and I just used my normal zig-zag foot rather than a roller foot or a walking foot. I did not have any issues with the fabric slipping as I sewed. I did not try to smooth the fur away from the seam until I had the fabric under the presser foot, because unless you pin it every 1/2 inch the fur would not stay in place anyway. For me, it was just easier to use my point turner and keep smoothing the fur as I stitched. Here’s a close-up of how I stitched – you can see I am bagging the lining and using a zig-zag stitch – I think the width was about 3.5 and the length 2.5. 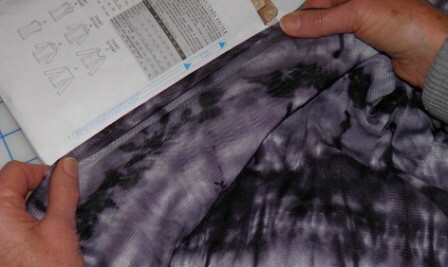 Donna Salyer does not recommend using interfacing, but suggested that staying seams might be necessary. 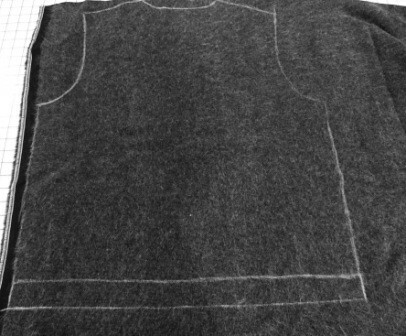 I chose not to do this, because my fabric backing was really quite firm and it just seemed unnecessary to me on a simple vest. 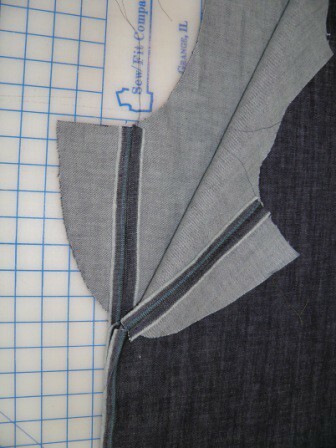 After I finished the machine stitching and turned the vest, I did need to pull some fibers out of the seam allowance. Again, not nearly as much seam cleanup work to do as I had thought might be required. All in all, this was an easy, quick project, and I have already had fun wearing it! Really. I should know better In fact, I DO know better. But sometimes that does not prevent me from doing something stooo-pid. Like using a super-duper stretchy mesh knit fabric on a pattern designed for fabric with approximately 25% stretch. Without modifying the pattern (enough) to compensate. Sigh. 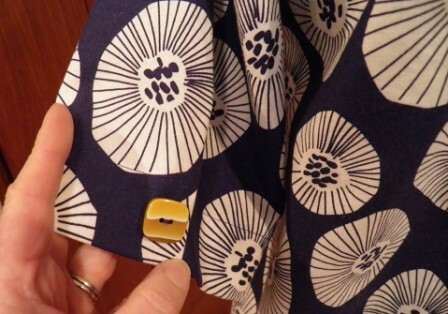 You would think after sewing for over 40 years…grrrr. Um, yeah. 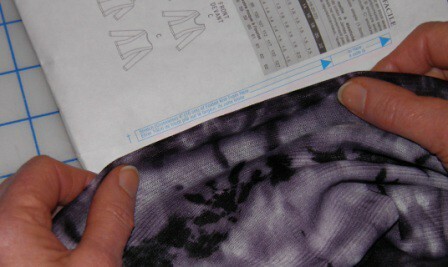 As you can see, I can easily stretch it beyond the end of the pattern envelope. What was I thinking? I am pretty sure I was just captivated by the purple. Or maybe my brain was disengaged the day I decided to mate this fabric and pattern. I really had to laugh the first time I tried it on. GI-normous. My dress form is a bit smaller than I am, but you get the idea. Nothng like a sloppy knit to make a girl feel special! Sheesh! I made a few feeble attempts to take in enough so this top didn’t look 4 sizes too big for me, but the effort-to-benefit ratio just did not make it worth my time. It has been quite a while since I threw a garment away, but this one went into the trash. It was one, hot mess of a knit top. Lesson learned, and hopefully not forgotten anytime soon! OK, it certainly isn’t on the same plane as my Chanel jacket, but today’s project turned out to be cutting up old t-shirts for wipes. Not the disposable kind that you buy in the store, but reusable disinfecting rags for quick cleanups. I know, I know; I am a little overly obsessed with trying to keep disposable products out of the landfills, but every bit of goodness helps, right? 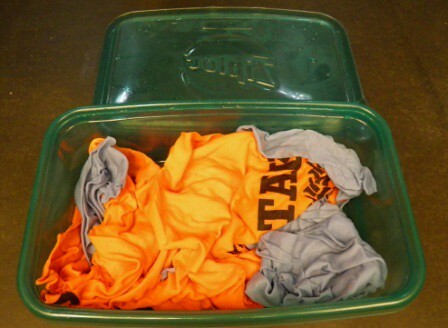 With 4 children and one husband, there are plenty o’ old T-shirts laying around my house from various fraternity functions, workplace events, etc. I grabbed a couple and cut off the sleeves, neck, and hems first, and then totally randomly with great care and precision cut them into exactly equal 6×6 inch squares. Or some facsimile thereof. 😉 I dumped them into a plastic container, and poured the magic solution over them until they were all wet and a little sloshy. The real test: bathroom wipe-downs. I have to say I think they worked really well, AND smelled great. A couple of sinks had some soap scum buildup, so I just added a little baking soda and they were clean in a jiffy. Sometimes it is the little things in life that are exciting, and today it was homemade disinfecting wipes. Woot!